You enjoy spending time in warm family atmosphere, don’t you? Then why not make your kitchen a centerpiece of your home? That is what a team of Taiwanese designers from the House Design studio did and we’d like to have a look at the final version! The project that we’re going to “visit” today is dubbed “The Family Playground”. 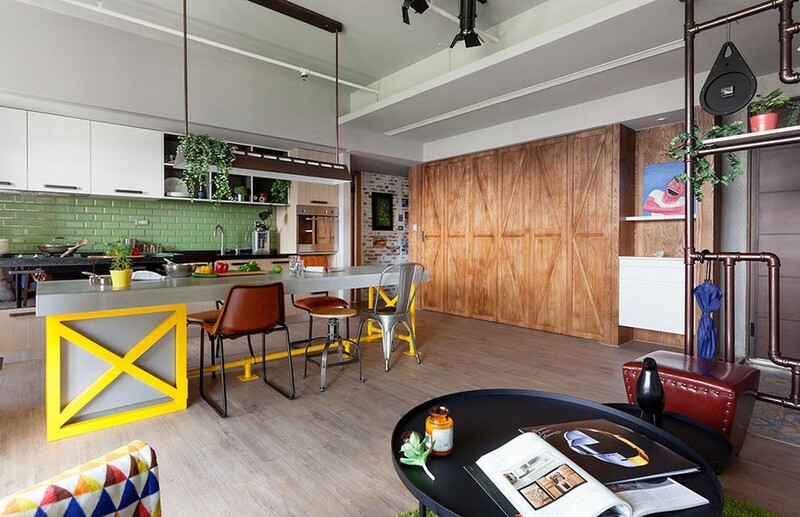 This apartment is located in the city of Kaohsiung on the picturesque island of Taiwan. 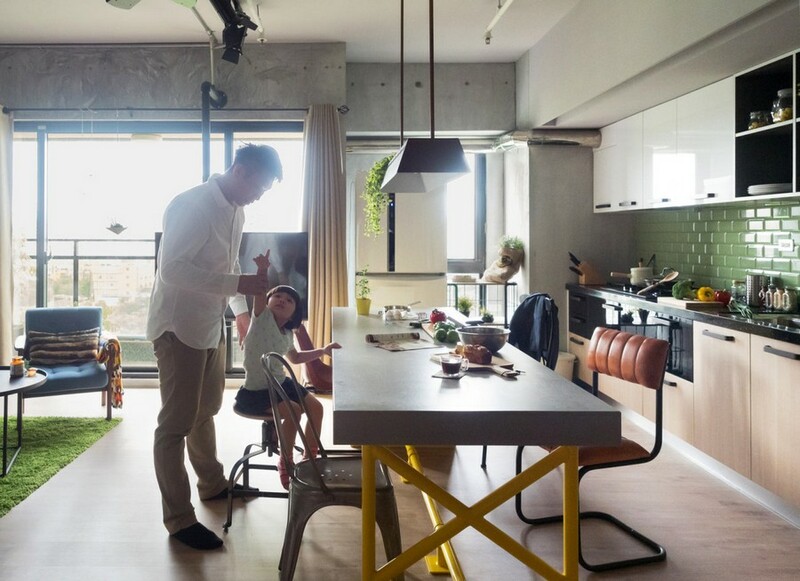 It was designed for a family couple and their little daughter, and hence the interior appeared to be warm, cozy and a little bit playful. 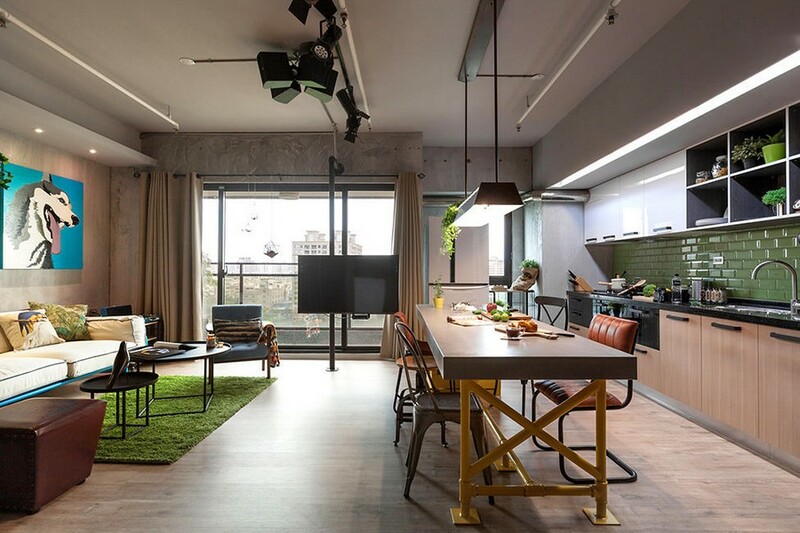 Despite the fact that the total area of the apartment amounts to 122 square meters, the center of attraction in this home is the kitchen: it takes over 50% of the total area and simultaneously plays the function of a lounge, hallway and study. 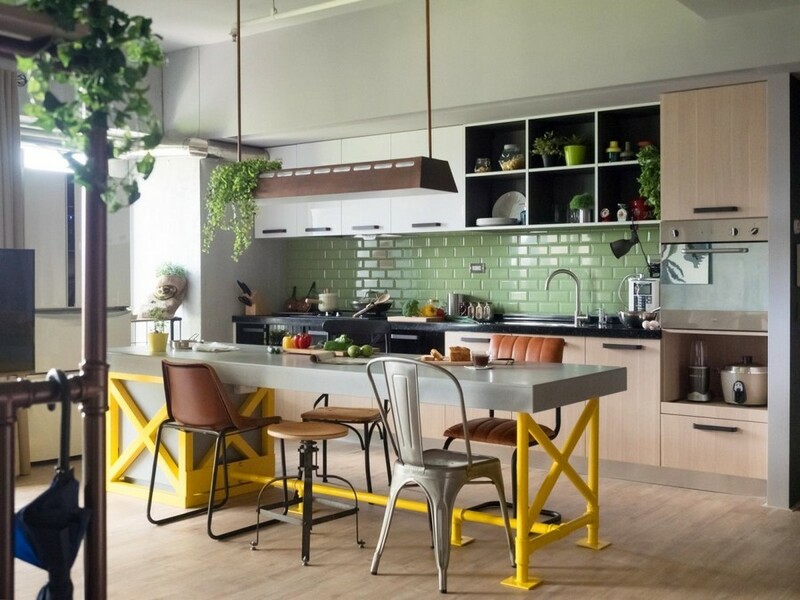 Such an interior solution is not deemed standard and typical, but given that both the wife and the husband are passionate fans of cooking, the emphasis was placed on the kitchen. Besides, while one of the spouses is cooking, the other may watch TV, which enhances communication in the family and lets people spend more time together. 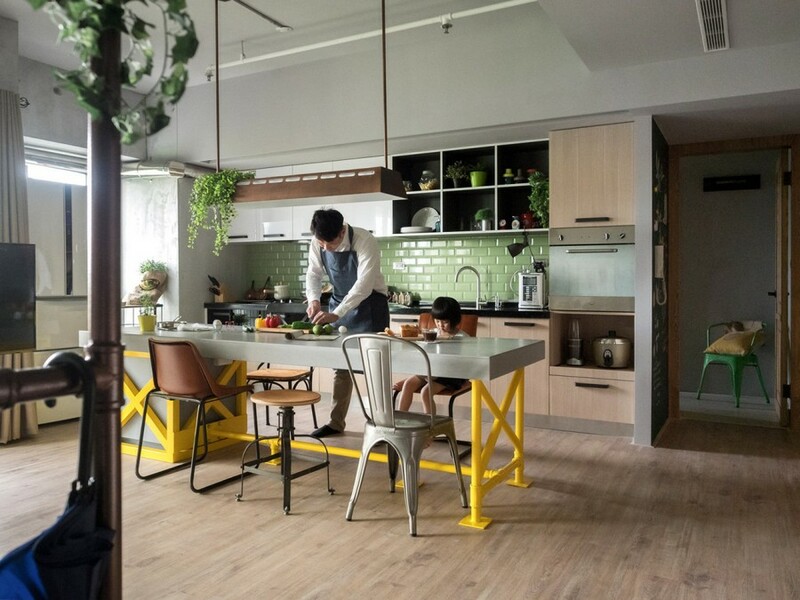 A big gray island on elegant yellow legs is not just a worktop for food preparation, but also a comfortable dining table for the entire family. 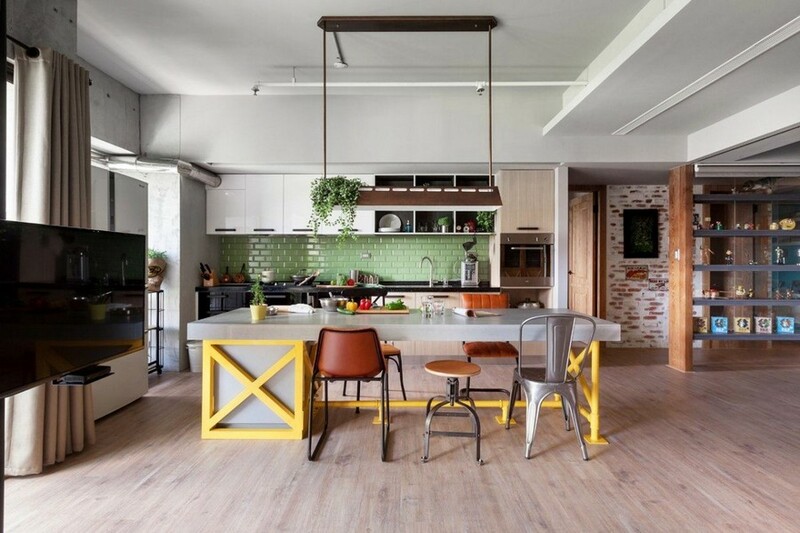 The role of seats is given to a set of mismatched chairs in industrial style. 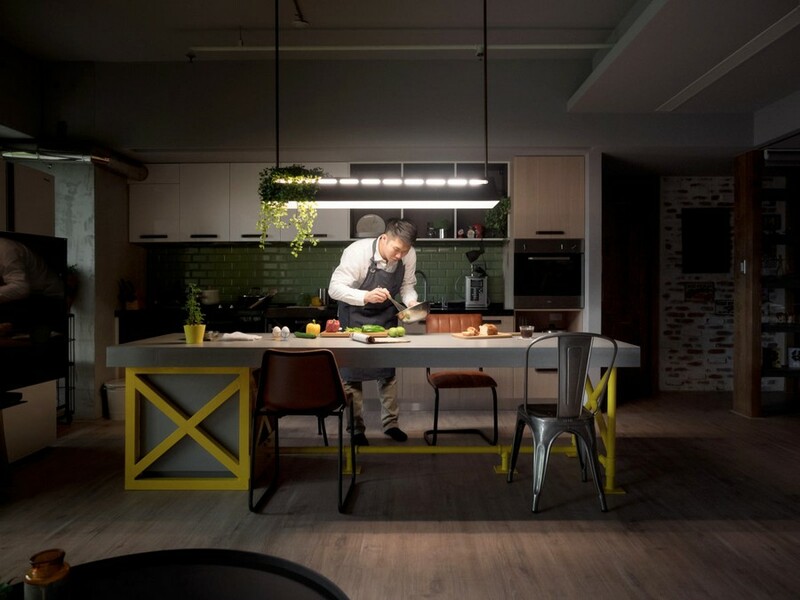 A mirrored lettuce green backsplash coupled with reflective glossy surfaces make the room appear even lighter and more spacious. 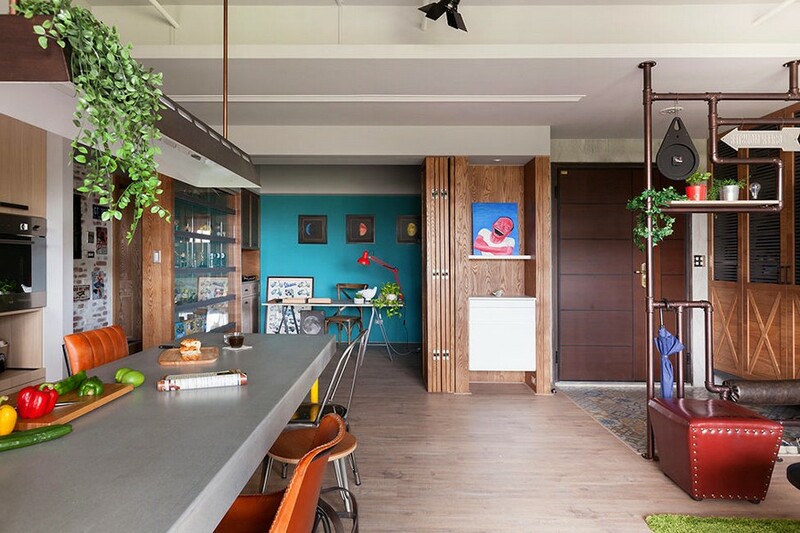 Such a trick is a win-win option for small kitchens, where boundaries of the space have to be expanded at least visually. In this huge open-concept space some room was provided for a lounge area. 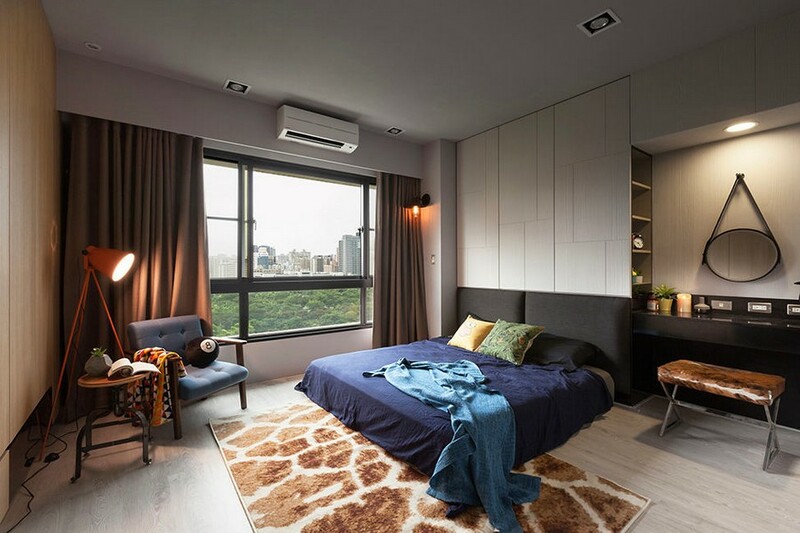 A big panoramic window fills the room with natural light. A competently arranged TV-set doesn’t overload the room and can be watched from almost any spot at the same time. 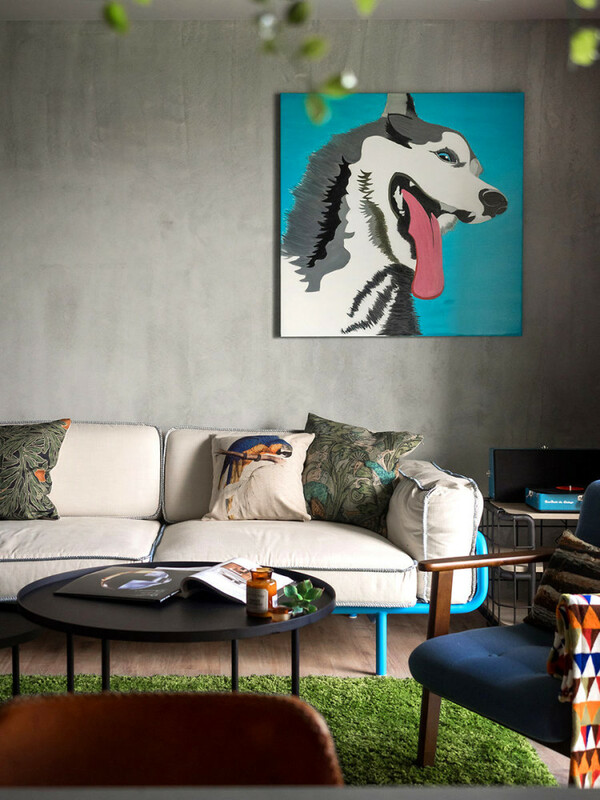 A blue “framing” of the sofa and a cheerful artwork on the wall are excellent accents that add the sense of genuine hominess to the interior. 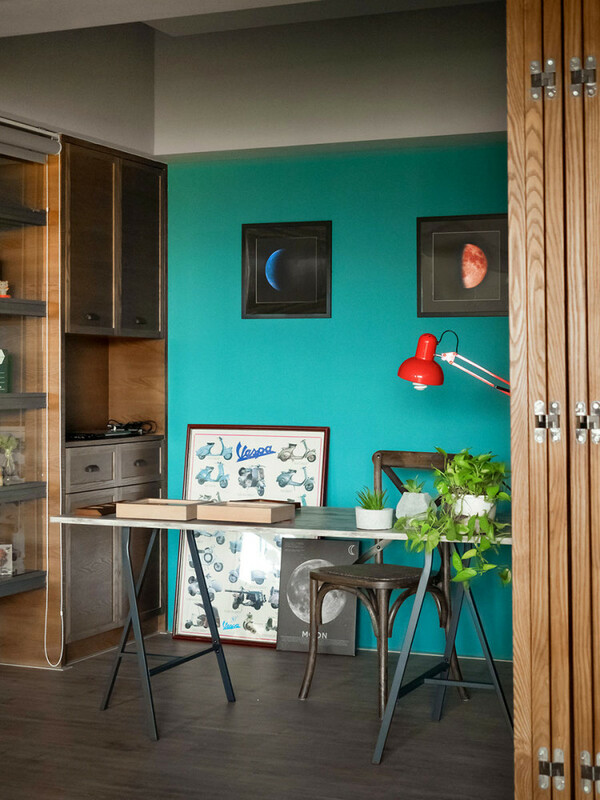 One more detail that deserves a special mention is a work area located right in the open space. When vacant, it harmoniously merges with the general image. 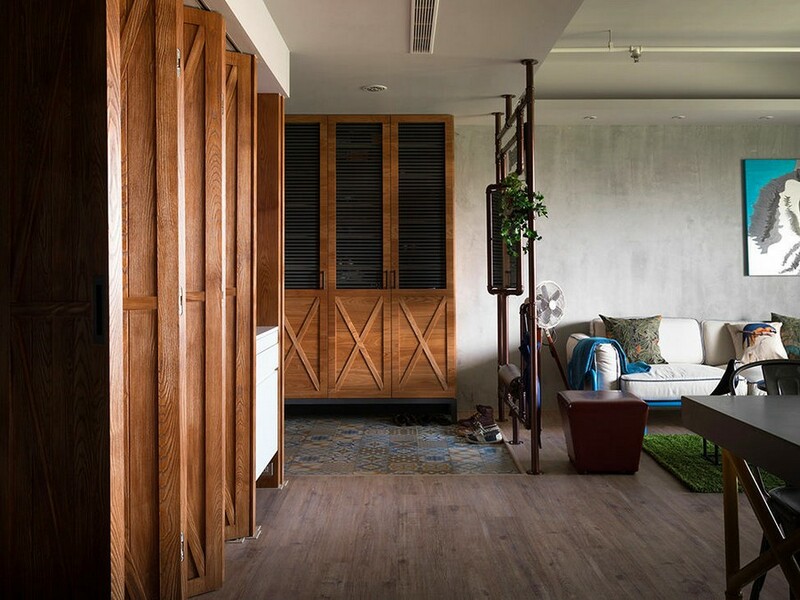 But as soon as one of the adults needs privacy, an almost invisible folding door allows for creating a cozy little nook for working in peace in no time. 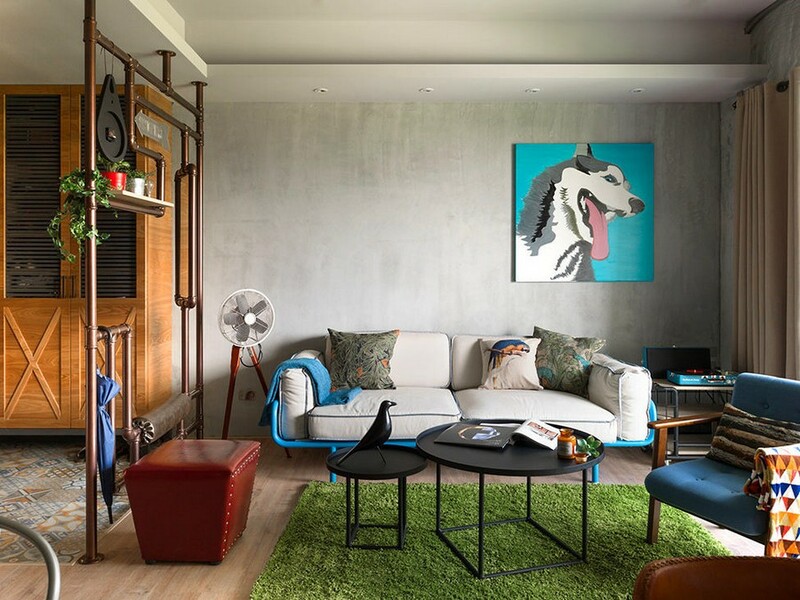 Finally, we feel obliged to focus on the metal pipe construction used for zoning the living room and separating the mudroom finished with patchwork floor tiles. 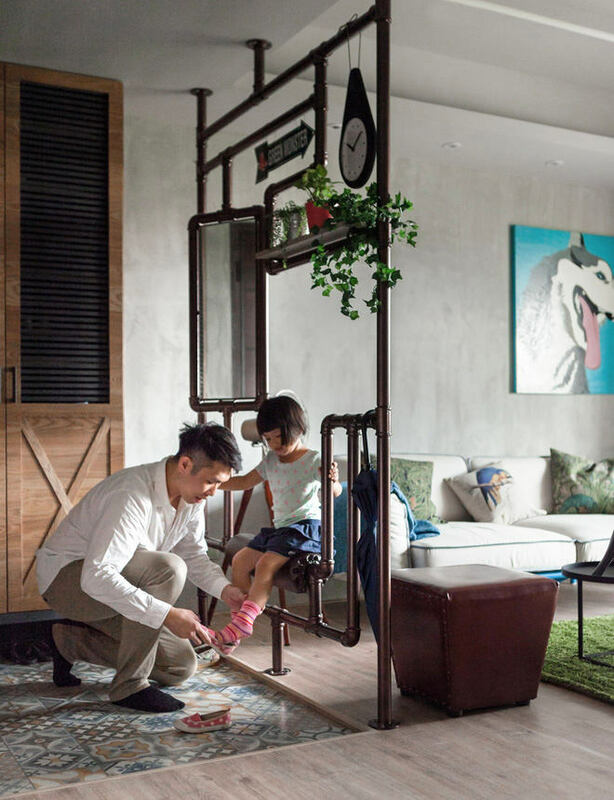 Here the pipes do not perform their natural functions, but their role is quite significant anyway: they’re a mirror holder, a plant stand, a bench for putting shoes on and a clock. 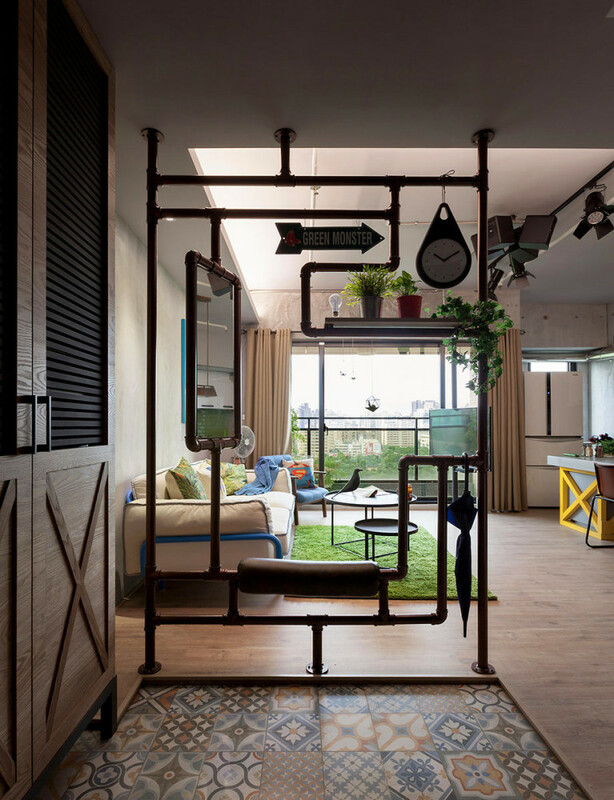 To our mind, this is the most original and stylish idea of re-using old pipes! 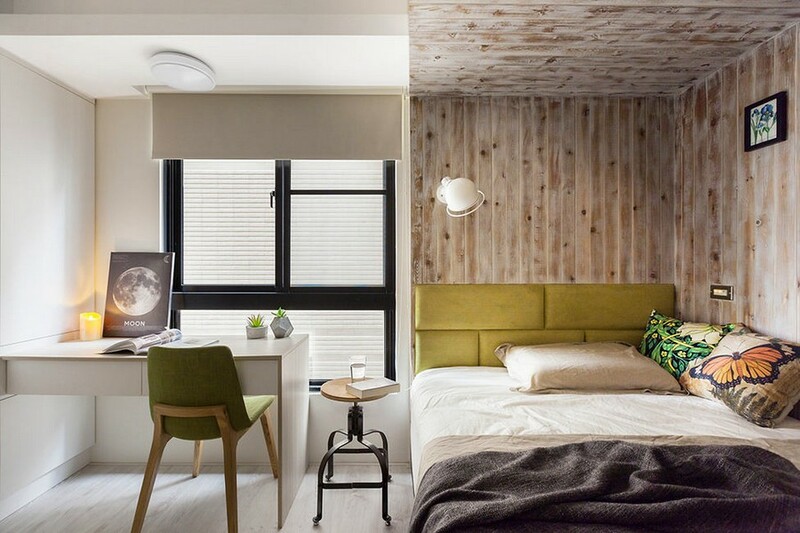 In the bedrooms we see functionality and coziness created by light color schemes and diluted with bright accents. There is nothing redundant, since all the non-standard solutions were presented to the kitchen. 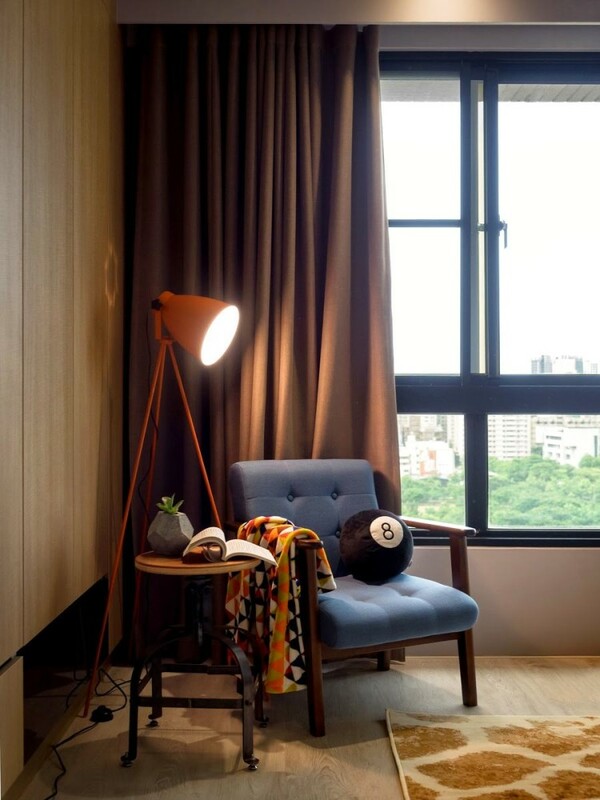 The thing that probably caught your eye in this apartment interior is plentiful of light despite a quite big total area for a family of three. 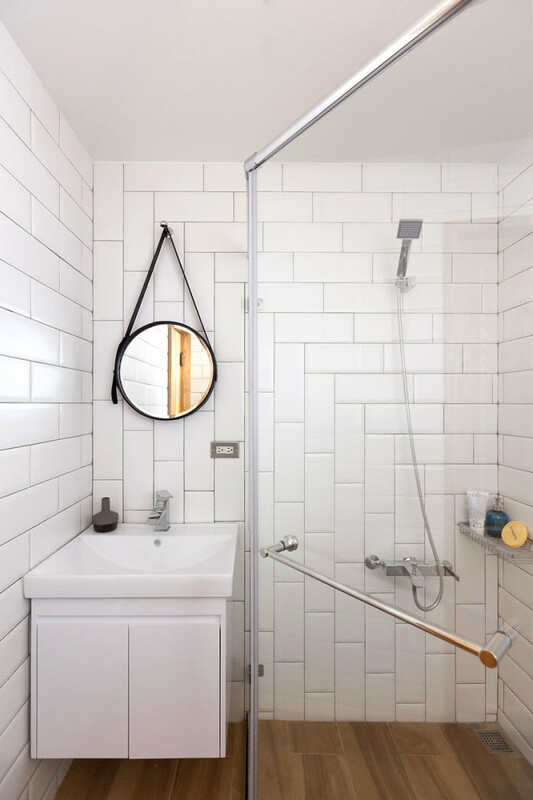 Even the bathroom is designed in pure white and equipped with a glass walk-in shower, which visually expands the space and adds some light to it. 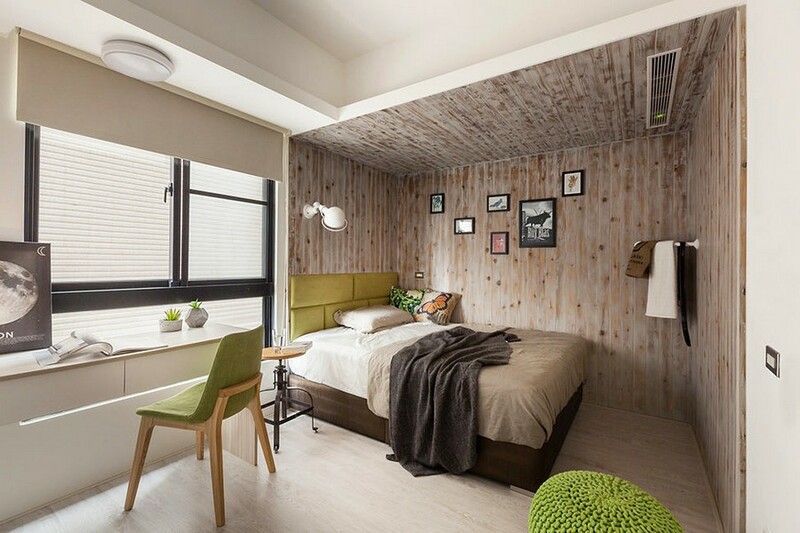 And the lack of color diversity is compensated by a non-standard way of laying rectangular wall tiles.